Nothing is better in school or work lunches than a freshly baked deliciously fluffy muffin. 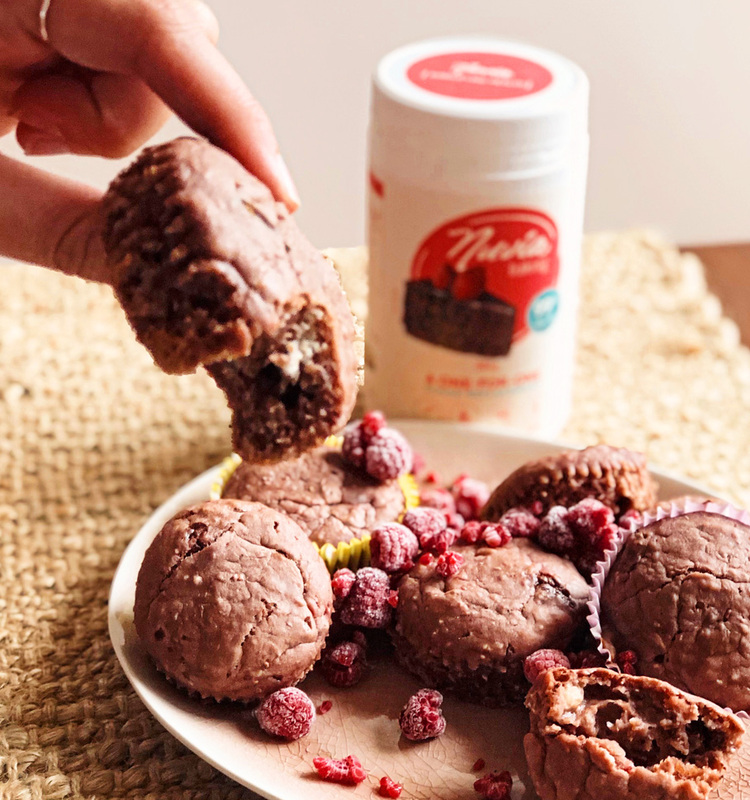 I created these delicious vegan, refined sugar free muffins combining two of my favourite things; chocolate and fruit. 3. Add salt, chia seeds and chocolate before mixing together and making a well in the centre. 4. Add in coconut oil and slowly add in almond milk stirring as you do. 5. 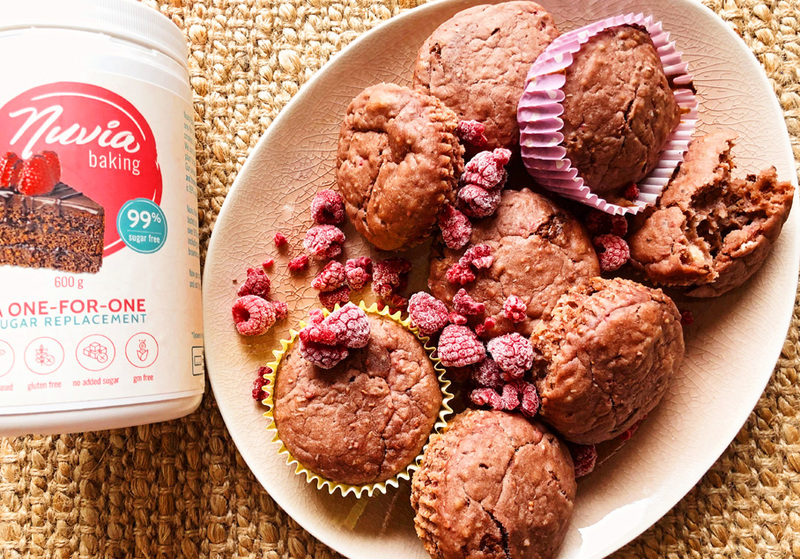 Once all almond milk is mixed in, defrost raspberries and lightly fold into mixture. 6. 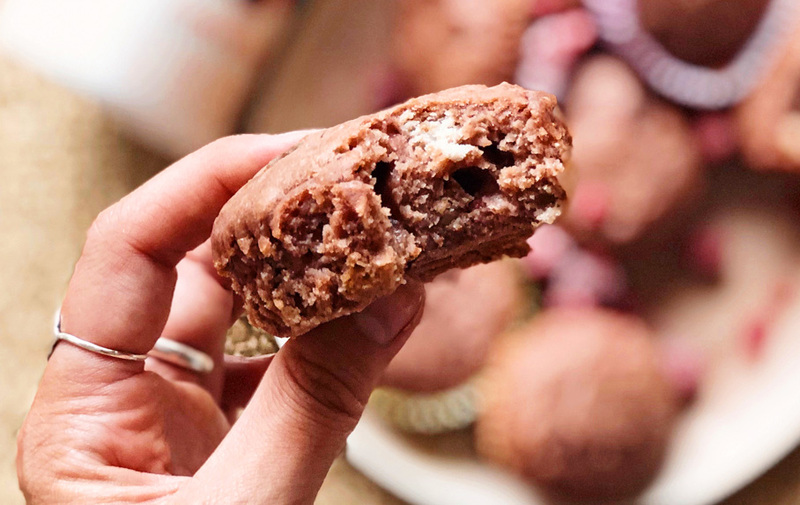 Scoop mixture into muffin tin so that they are ¾ full. 7. Place in oven for 15 minutes before checking, if they are still soft to touch and only slightly gooey in the centre they are ready. 8. Pit cherries and cut in half before placing in medium saucepan over medium-low heat, cover and cook until most of the juice has been separated (3-5 minutes). 9. Combine the corn flour and Nuvia natural sweetener in a bowl, whilst still hot add cherries and stir well. 10. Return pot to the stove and heat over low heat for a few more minutes until mixture thickens, stir frequently to ensure mixture doesn’t burn. Allow to cool. 11. These muffins will be a little softer as this is how I prefer them. If you want them a bit firmer leave in the oven for further 5-10 mins. Try to mix delicately / fold batter where can to allow to aerate and not over stir. Perfect for school lunches and / or work snacks. Liv aka Nourishinglively a breakfast loving brunch going foodie enthusiast that has a passion for all things aesthetically pleasing and delicious. With a love for health, wellness and nutrition Liv started her foodie Instagram adventures back in 2015 & has grown to love the supportive community with which she is surrounded with through her page @nourishinglively__ & blog. Creating recipes that are both tasty and healthy is a massive focus for Liv who collaborates with like minded brands and companies. 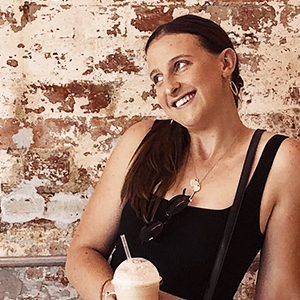 Breakfast is her specialty and smoothie bowls are her favourite, if you’re looking for brunch places in Melbourne this is your go to follow!